You mentioned reclaimed water briefly in this blog. 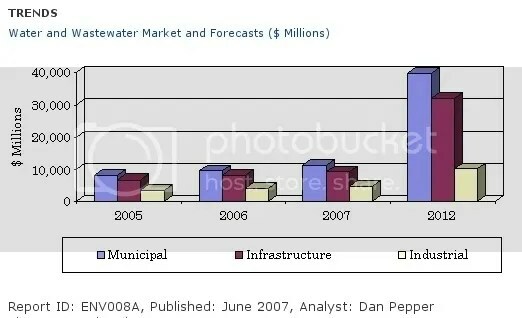 I wonder about the progress of reclaimed water utilization globally. I know in Southern California for instance, lack of infrastruture and perseptions about the quality of reclaimed water has stifled it’s use. I visited a plant in San Pasqual California that was dumping tertiary treated water into the ocean (at least cleaner than it would have been prior to treatment) because they could not market the water. This in a heavy fruit tree growing area. I know they also had serious issues with the solids that remained after treament. It was some 10 years ago when I last heared anything about the state of reclaim water use and would be interested in any information about its progress. Well, I am by far, not an expert in the field of reclaimed water, as I have only visited one reclaimed water facility. I think there could be a lot of benefit to using reclaimed water, especially for uses that do not require potable water such as in bathrooms, industrial processes, possibly agricultural, etc. As far as the purity of reclaimed water, with recent membrane technology, it seems that some reclaimed water facilities are able to purify the water to a very high quality. The Class A reclaimed water facility that I visited said the water was clean enough to be used in a swimming pool. I have also heard of the same problems of businesses or homes not being able to hook-up to the necessary infrastructure in order to get reclaimed water or municipalities not being able to afford to construct “the purple pipe” all over town to supply the reclaimed water.